Picture this: You are standing in a dugout in St Louis. It is the seventh game of the World Series. The team you have managed for most of the year is nursing a 3-2 lead over the home Cardinals as you enter the bottom half of the sixth inning. Your ace pitcher, the eventual Cy Young Award winner, Pete Vuckovich is on the mound. This was not just any team. These were the Milwaukee Brewers. This team represented the town where Kuenn grew up. He was an All-American shortstop for his home-state University of Wisconsin Badgers. He married a former Miss Wisconsin. He won the American League Rookie of the Year Award in 1953 and the American League batting title in 1959. Oh, and he had a leg amputated below the knee. Harvey Edward Kuenn Jr. was born on December 12, 1930, in the Milwaukee suburb of West Allis, Wisconsin. He was the only child born to Harvey and Dorothy (Wrensch) Kuenn. The Kuenns were the typical German-American blue-collar family that so heavily populated Milwaukee. Both of Harvey’s parents worked for a paper and packaging processing firm in Milwaukee. Harvey Sr. worked on the dock as a shipping clerk while Dorothy ran the company’s credit union. Kuenn grew up on Milwaukee’s south side, where his father would work with him almost daily on his baseball skills. Harvey Sr. had been a talented third baseman on some of the top area teams in Milwaukee. He once got a tryout with the minor-league Milwaukee Brewers but did not make the club. He began teaching his son how to hit at a very early age and vowed that one day Harvey Jr. would be a major league-hitter. Eventually, Kuenn developed into a baseball-obsessed child. He played baseball from sunup to sundown. When it rained, he would take a ball to the basement and throw it around down there. Among Harvey Jr.’s early influences were some people who had major-league experience themselves. At the age of 12, he played for Jack Kloza’s team. Kloza had a cup of coffee with the St. Louis Browns in the early 1930s. He appeared in 25 games as an outfielder for the Browns in 1931 and 1932. Kloza ended his career as a member of the minor-league Brewers and settled in Milwaukee. Harvey also attended a baseball camp run by Bunny Brief. Brief had been a major league outfielder with the Browns, Chicago White Sox and Pittsburgh Pirates from 1912 to 1917. Like Kloza, he ended his career with the Brewers and settled in Milwaukee. During Harvey’s childhood, Brief had run a baseball camp on the city’s south side. Kuenn attended Milwaukee Lutheran High School, where he was a standout three-sport athlete who became the first athlete in school history to earn 10 letters. He earned four letters in baseball and three each in basketball and football. Among his accomplishments at Lutheran was a 52-yard dropkick field goal in October 1948 while playing for the Lutheran football team. He was named all-conference at quarterback his junior and senior years and received honorable mention all-state as a quarterback his senior year. In basketball, he led his team to three straight Wisconsin Prep Conference titles. He led the conference in scoring in basketball in both his junior and senior seasons and was named all conference at forward all three years. It was in high school where Kuenn first began to attract the attention of major-league scouts. His .425 batting average over his three-year career there was the highest in school history. Several scouts wanted to sign him right out of high school but Kuenn decided to continue his education. While in high school, Kuenn spent his summers playing baseball for the Highway Beer Depot team, sponsored by a Milwaukee-area liquor store. A teammate of his with the Depot team, Ron Unke, was also a teammate of his at Milwaukee Lutheran. Because both Kuenn and Unke, a right-handed pitcher, were believed to be asking for $50,000 from major league scouts, the Highway Depot team became known as "the $100,000 team." Unke and Kuenn were also teammates at Wisconsin. Unke eventually signed with the Cardinals and spent four years in their minor league system. “Tex” Belich ran the Highway Beer Depot team. Tex and his brother Emil, who was a scout for the Philadelphia Phillies and Boston Braves, were very influential in Harvey’s further development as a player. Kuenn developed a brother-like relationship with Emil, who had a brief minor-league career in the early 1940s, never rising above Class D Ball. Harvey often sought the advice of the Belich brothers not only on baseball matters but on life matters as well. After graduating from high school in 1949, he opted to go to Luther College in Decorah, Iowa, to play football and baseball. After a week at Luther, he decided he did not like it there so he hitchhiked home. After returning to Milwaukee, he decided to accept a scholarship offer from the University of Wisconsin to play baseball for the Badgers. Kuenn enrolled at Wisconsin for the second semester in January 1950. Kuenn, who stood 6-foot-2 and weighed 190 pounds, played junior varsity basketball for the Badgers in the 1950-51 season. He made the varsity team as a forward in the fall of 1951 but left the team in February to focus on baseball. While attending school in Madison he was a member of the Delta Upsilon fraternity. As a member of the Badgers' baseball team, Kuenn quickly established himself as a top hitter. He captained the freshman team in 1950. He moved to varsity his sophomore year and became the starting shortstop. In his junior year, he served as team captain and led the Badgers to a third-place finish in the Big Ten. After leading the conference in six offensive categories, he was named the first team All-Big Ten shortstop. He also became the first Badger in the program's history to be named first team All-American. His .436 batting average was the highest of any member of the All-American team. His career average of .382 ranks as the second highest in the program’s history. His coach at Wisconsin was Arthur "Dynie" Mansfield, who had played collegiate baseball for the Badgers and minor league ball in the New York Giants organization in the 1930s. He coached the Badgers' baseball team from 1940 to 1970 and Kuenn developed a great deal of respect for him during his time in Madison. After signing his first pro contract, Harvey gave Mansfield a lot of credit for his success. While attending school in Madison, Harvey met Dixie Sarchet, who won the Miss Wisconsin-USA beauty pageant in 1954. She and Harvey married in October 1955. Together they had two children. A daughter, Robin, was born in the summer of 1956 and a son, Harvey III, was born in December 1958. As an amateur, the right-handed-hitting Kuenn had developed a reputation as a solid line drive hitter. He did not have much power. Kuenn, most thought, could have hit for power, but that was not his strong suit. He could hit about any pitch to any part of the field that he wanted. That is what made him so valuable. He once said that he did not like to hit home runs because they tended to throw off his hitting rhythm. After completing his junior year there was a lot of speculation that Kuenn would opt to give up his final year of college eligibility to sign a pro contract. Teams were offering $50,000 and more for him to sign. After the season, he sat around a table with the Belich brothers and Mansfield and opened up the 12 sealed bids that he received. From there Kuenn narrowed his choices down to the Detroit Tigers and another team. After discussing it with his parents, he chose the $55,000 bonus offered by the Tigers. Kuenn signed the contract on June 9, 1952. While it was called a bonus, the $55,000 served as his first three years’ salary. Kuenn used some of the money to buy a new home for his parents in Milwaukee. Tiger assistant farm director John McHale had, at the urging of scout George Moriarity, watched Kuenn play in his final college game. After that game, the Tigers decided to make the $55,000 offer. There had been some concern from some organizations that a knee injury from his prep football days would prevent Kuenn from realizing his potential. Word of the knee injury had caused the Boston Red Sox to drop out of the bidding. This injury had caused the military give him 4-F status and kept him out of the service. Upon signing Kuenn, the Tigers sent him to Davenport (Iowa), their Class B team in the old Three-I League. In the summer of 1952, Kuenn hit .340 in 63 games with Davenport. One of the highlights of his time there came on July 29 against Burlington. That day he broke up a no-hitter with two out in the ninth. That single allowed Kuenn to extend his hitting streak to 18 games. Because of his success, Kuenn finished second in the MVP balloting for the Three-I League that year and earned a call-up to the Tigers on September 6. When Kuenn made his major-league debut in September of 1952, the shortstop position was manned by veteran Johnny Pesky. Pesky, a Boston legend, had come over to Detroit in a nine-player deal between the Red Sox and the Tigers that June. When Kuenn arrived, Pesky took him under his wing and assisted him in his transition to the majors. When Kuenn arrived in Detroit Fred Hutchinson managed the Tigers. “Hutch,” as he was known, was an All-Star pitcher with the Tigers in the 1940s and ’50s. The Tigers named him player-manager in the middle of the 1952 season, replacing Red Rolfe. Hutchinson was a big Kuenn supporter from the start. In 85 plate appearances in September 1952 Kuenn hit .325. Maybe the most amazing stat to come out of that month was the fact that he only struck out once in those 85 plate appearances. That was to the Indians’ Bob Lemon, a future Hall of Famer. For the next nine years, Kuenn never finished worse than fifth in the AL in number of at bats per strikeout. After the 1952 season, Kuenn returned to Madison to continue to work on his degree. Even so, he never did graduate from college. Kuenn arrived in Florida for spring training in 1953 as the starting shortstop. Kuenn did not disappoint. As a 22-year-old rookie batting out of the leadoff spot most of the season, he led the league in plate appearances, at-bats, and hits. His 679 at bats were a new American League record. He made the AL All-Star team and won the Rookie of the Year Award. In the rookie voting, he received 23 of 24 votes. Kuenn had established himself, at the age of 22, as one of the game’s best hitters. However, Kuenn was not the only young Tiger making noise. In June of 1953, an 18-year-old kid from Baltimore by the name of Al Kaline made his big-league debut in a Tiger uniform. For the remainder of the decade, the “K & K Boys,” gave the Tigers one of the best one two punches in baseball. While they got along and clicked well as teammates Kaline and Kuenn were quite different. Kaline, who never played a single inning of minor-league ball, was quiet and shy. He was the son of a Baltimore preacher. Kuenn, meanwhile, was rarely seen on the field without a mouth full of chewing tobacco and was known to like his beer. He claimed the tobacco made him drink less water during the game. The next three seasons saw Kuenn continue to build his reputation as one of the game’s best hitters. He finished no lower than seventh in the AL batting race in any of those years. Over his career Kuenn led the league in doubles three times (’55, ’58, ’59) and in hits four times (’53, ’54, ’56, ’59). In the off-seasons, Kuenn returned to Milwaukee. He spent his winters staying in shape by bowling. Kuenn maintained good winter conditioning by bowling three times a week. His league averages ranged from 181 to 195. He posted one 671 series. His father, Harvey Sr., was the captain of one of the teams. In one offseason Kuenn went to work at the West Allis Bank in his hometown of West Allis, Wisconsin. He later opened a pro shop in Milwaukee that sold sporting equipment of all types. It was while spending time in Milwaukee that Kuenn developed a close friendship with Milwaukee Braves third baseman Eddie Matthews. During spring training 1957, Kuenn flew to Washington State to be the best man at the wedding of teammate, pitcher Billy Hoeft. Hoeft was another Wisconsin native from Oshkosh who married a woman from Lakeland, Washington, on February 25. Both Hoeft and Kuenn had been signed by scout George Moriarity, the former Tigers third baseman and manager and AL umpire. Hoeft returned the favor by serving as Harvey III's godfather. In 1957, suffering through defensive problems, Kuenn slipped to a .277 batting average. Kuenn had become too big to play shortstop and had lost a step. The Tigers decided to move him to third base for the 1958 season. The Tigers later changed their mind and moved Kuenn to center field. There he would join Kaline in right and Charley Maxwell in left. Because Kuenn was the Tigers’ team captain, the poor season was even more disappointing. Coming off a poor year in 1957, Kuenn was forced to take a $3,000 pay cut for the 1958 season. In 1958, Kuenn returned to his old self. He hit .319 to finish third in the league behind Boston Red Sox teammates Ted Williams and Pete Runnels. He also led the league with 39 doubles. Kuenn also received heavy praise from several for his play in center field. None other than Leo Durocher, who had said Kuenn would never make it in the outfield, said Kuenn had adapted well to his new position. After watching Kuenn on television make a great play at Comiskey Park, Durocher said that only Willie Mays could make a play like that. In his first year in center, he led the league’s outfielders with 358 putouts. In 1958, Kuenn and Jim Smilgoff collaborated to write a book, Big League Batting Secrets. Kuenn’s teammate Kaline wrote the book’s introduction. Smilgoff was a minor-league catcher from 1933 to 1936 who had befriended Kuenn. He was also a legendary high school coach at Taft High School in Chicago. Two years earlier Smilgoff had written his own book, Winning High School Baseball. The 1959 season came with much optimism for Kuenn. His hitting had returned to its pre-1957 level and he had become comfortable in a new position. His performance in 1958 proved that the 1957 season was an aberration. Kuenn ran away with the 1959 AL batting championship. His .353 batting average was 27 points higher than that of teammate Kaline, the second-place finisher. The .353 batting average included a career-high 22-game hitting streak in midsummer. As the 1960 season approached, trade rumors swirled around Kuenn. It was rumored that Kuenn would be traded to the Cleveland Indians for reigning AL home run king Rocky Colavito. Cleveland GM Frank Lane had been trying to pry Kuenn from the Tigers since before the 1957 season. In January 1958, Lane went on NBC’s Today show and announced that he had offered pitcher Hank Aguirre, catcher Jim Hegan, first baseman Vic Wertz and outfielder Gene Woodling to Detroit for Kuenn. The Tigers rejected the offer; all but Woodling eventually made their way to Detroit later. After winning the batting crown in 1959, Kuenn, who had developed a reputation as a tough negotiator, asked the Tigers for a $10,000 raise for 1960. This would bring his pay to near $50,000, making him one of the highest-paid Tigers ever. The Tigers merely laughed at the suggestion. Meanwhile, Colavito had asked the Tribe for a raise from $28,000 to $45,000. He got no better reaction than Kuenn did. This further fueled the trade rumors. Kuenn, who did not want to leave Detroit, became nervous when the rumors surfaced and settled with the Tigers for $42,000. Colavito settled for $35,000 in the first week of March. After they signed, the two teams announced the trade was dead. On April 17, two days before Opening Day, the trade was made and Kuenn was now an Indian. This was the only time in baseball history that a league batting champion had been traded for a home run champion. The reaction in Cleveland was swift and extremely negative. Calls to the Indians ran 7 to 1 against the trade. Colavito was a hero in Cleveland and the fans were not happy to see him go. Many threatened to boycott Indians games. Despite this, Lane said that in acquiring Kuenn he had traded “hamburger for steak.” The reaction in Detroit was surprisingly positive given how popular Kuenn was there. However, it was clear that the Tigers needed more power. The Indians and Tigers opened the season against each other just two days after the trade. Colavito had what he called the worst day of his career, striking out four times in his Tigers debut. During his eight years in Detroit, Kuenn had played six different positions. He had played everywhere except second base, catcher and pitcher. With the Indians he was an outfielder. He was placed in the second spot in the order after second baseman Johnny Temple. Kuenn hit .308 for the Indians in 1960 and made the All-Star team for the eighth straight year. This was his last appearance on an All-Star team. He played mostly in right field with an occasional game in left or at third base. In December of that year, the Tribe traded Kuenn to the San Francisco Giants for veteran pitcher Johnny Antonelli and outfielder Willie Kirkland. Kuenn got off to a bad start in his first season in the National League. He hit .265 in 1961. At the time, that was a career low for him. Despite that, the Giants did not cut his pay. Entering spring training in 1962, he vowed to bat .300. He kept his word and hit .304 as the Giants won the NL pennant and Kuenn made his first postseason appearance. He went 1-for-12 in the 1962 World Series as the Giants lost to the New York Yankees in seven games. His son later said that Harvey played the series with a broken pinkie finger. Harvey’s father died in May 1962, and Harvey missed four days with the team to attend the funeral in Milwaukee. The Giants traded Kuenn to the Chicago Cubs in May 1965. The Cubs sold Kuenn to the Phillies in April 1966, three games into the season. As a result, Kuenn’s tenure under new Cubs manager Leo Durocher was cut short. He played the 1966 season with the Phillies under Gene Mauch. On September 9, 1965, Kuenn struck out in the bottom of the ninth to become the final out in Sandy Koufax’s perfect game. Kuenn had also been the final out in the Dodgers ace’s no-hit triumph over the Giants in May 1963. The Phillies left Kuenn off the roster during the offseason leading up to the 1967 season. He did receive an invitation to spring training in the hopes he might be able to fill in for injured first baseman Bill White, who was expected to miss the start of the season with a torn Achilles tendon. However, just as spring training was about to begin, Kuenn suddenly announced his retirement from baseball. He had accepted a job at a Milwaukee television station. Throughout his playing career Kuenn had been very active in the Players Association. As Tigers team representative, Harvey took an active role in the players' move to abolish the reserve clause. In 1959, he was elected head player rep for the American League. He, along with Phillies pitcher Robin Roberts and Los Angeles Angels third baseman Ed Yost, were the driving force behind the union’s growth in the early 1960s. Kuenn was a member of the four-man committee that hired Marvin Miller as head of the union in 1965. He served as the ten o’clock sports anchor at WVTV in Milwaukee for a couple of years. Eventually WVTV dropped its sports programming and Harvey took a job as a sales representative with a local printing company. In 1969, when the expansion Montreal Expos named Mauch their manager, Mauch offered Kuenn a job on his coaching staff. Kuenn, after discovering that his children did not want to move to Montreal, turned down the offer. In 1971 the Milwaukee Brewers, who had moved from Seattle for the 1970 season, named Kuenn as their new batting coach. In this role, Kuenn mentored some of the game’s top young hitters. Among them were future Hall of Famers Robin Yount and Paul Molitor. Ironically, the Brewers general manager who hired Kuenn was none other than “Trader” Frank Lane, who as Indians GM in 1960, made the trade that brought Kuenn to Cleveland. During the 1971 season, the Brewers put Kuenn on the active roster for the last month of the season. The Brewers did this so he would be able to add service time in order to improve his players’ pension. Kuenn never got into a game. In fact, on September 17 he left Milwaukee to help coach the Brewers Instructional League team in Arizona. Harvey and Dixie divorced in 1971. In October 1974 he married Audrey Cesar, a native of the Milwaukee area. Audrey’s parents owned a bar near County Stadium. Several baseball people patronized the bar. Harvey met Audrey at the bar. Brewers announcer Bob Uecker served as best man at the wedding. Audrey eventually took over the bar from her parents, and she and Harvey moved into a place behind the bar. The Kuenns would spend their summers in Milwaukee but wintered in Arizona. Kuenn served as interim manager of the Brewers following the firing of Del Crandall with two games remaining in the 1975 season. Kuenn was hopeful that the Brewers would offer him the job for the 1976 season. The Brewers decided to give the job to Alex Grammas, a longtime protégé of Cincinnati Reds manager Sparky Anderson who had served for years as Sparky’s third base coach in Cincinnati. Other than his brief stint as interim manager, Kuenn served as Brewers hitting coach from 1971 to 1982. In 1976, Kuenn underwent open-heart surgery and had a quadruple bypass. The bypass was the result of poor circulation, a condition that would plague him the rest of his life. In 1977, Crohn’s disease, a stomach ailment, kept him hospitalized for four months during the season. The Expos took Kuenn’s son, 18-year-old Harvey III, in the 20th round of the June 1977 amateur draft as a first baseman. Kuenn the younger had played high school ball for Milwaukee Central High School. He hit .215 for the Expos’ Rookie League team in 1977. Following that season the Expos released him, and he was signed by the Brewers. He hit .214 in 23 games for Newark of the New York-Penn League in 1978. That ended his professional baseball career as a player. In January 1990, he took a scouting job with the Brewers and remains with that organization to this day, currently as a Midwest area scout for the Brewers. In 1978, the Brewers hired Harry Dalton as their new general manager. Dalton, who had built the Angels and the Baltimore Orioles into contenders, was named to replace Jim Baumer, who had been fired by team president Bud Selig. Dalton immediately began turning things around in Milwaukee. He hired Orioles pitching coach George Bamberger as the team’s new manager. In spring training, he released outfielder Von Joshua. Joshua had been the team’s best hitter a season earlier but Dalton thought he did not hustle enough. Because of these and other moves and others, the Brewers had the first winning season in franchise history in 1978, much to Selig's delight. Over the years, Kuenn had developed a good relationship with Selig. Both had grown up in Milwaukee around the same time and thus had a lot in common. Kuenn always felt a lot of gratitude to Selig for sticking with him through all his health problems. In 1980, Kuenn faced the toughest health battle of his life. He had been complaining about a foot problem that had been bothering him. He told his son that whenever he put the foot on the ground it would turn white. The problem resulted from the poor circulation that had led to his quadruple bypass four years earlier. In 1981, the Brewers, under manager Bob “Buck” Rodgers, made their first postseason appearance. Spurred on by the hitting of Yount, Molitor and Cecil Cooper and the pitching of newly acquired relief ace Rollie Fingers, the Brewers captured the second-half title in the American League East Division. (The major leagues played a split season in 1981 because a bitter players’ strike interrupted the season.) They lost to the first-half champion New York Yankees three games to two in the AL Championship Series. The 1982 season started with much optimism in Milwaukee. After four straight winning seasons, the Brewers were in a position to make a run for the AL East flag. However, that optimism quickly turned sour. On June 2, with the team struggling to a 23-24 record to start the season, Dalton fired Rodgers and named Kuenn to replace him. 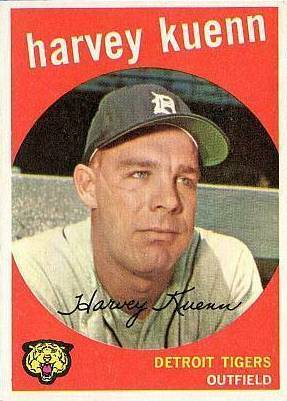 Kuenn would finally get the opportunity he had dreamed of since the 1958 Tigers considered him as a possible player-manager. After the firing, Rodgers was quoted as saying his firing was the result of some cancers on the team. Several players on the club did not like Rodgers’ managerial style. Some of his biggest critics were thought to be Fingers, catcher Ted Simmons, and center fielder Gorman Thomas. Immediately after his hiring, Kuenn held a team meeting and told the players just to go out and have fun. The team seemed to loosen up. He set the batting order and rarely changed it. He seemed to trust his pitchers more than Rodgers did. As a result, the team began to play better baseball. After going 23-24 under Rodgers, the team suddenly took off and went 20-7 in June, hitting an unbelievable .294 as a team. They also hit 47 home runs in those 27 games and averaged over six and a half runs a game. Some believed the respect Kuenn had built up among the players over his years as the hitting coach made the players want to play well for him. It is known that Yount had a deep respect for Kuenn. Yount had come to the majors at age 18 and Kuenn was the only major league batting coach he had ever known. In 1982, Yount was named AL MVP after batting .332 and hitting 29 homers. Whatever the reason, the players responded to Kuenn the way Dalton had hoped they would when he hired him. The Brewers went 72-43 under Kuenn to finish with 95 wins. However, even with that, the season’s outcome came down to the final series of the season. The Brewers were three games up on the Orioles for the AL East lead with four games to play. Those four games consisted of a four-game weekend series in Baltimore. There was a doubleheader scheduled for Friday and single games on Saturday and Sunday. Baltimore swept Friday’s doubleheader to move within one game of Milwaukee with two to play. They also won Saturday’s game to move into a tie for first. Therefore, the season came down to one game on Sunday to win the division title. The game featured two future Hall of Fame pitchers going against each other. Jim Palmer, Baltimore’s perennial Cy Young contender, faced Don Sutton, whom the Brewers had acquired from the Houston Astros in a trade barely a month earlier. On Sunday, Yount hit a pair of homers, and Sutton allowed just two runs over eight innings as the Brewers won the game, and the division, by a score of 10-2. Kuenn had taken his team to the postseason. Along the way, his team hit 216 home runs. That was the most that any major league team had hit since the Minnesota Twins hit 225 in 1963. There was power throughout this lineup. Led by Thomas’ league-leading 39 home runs, the Brewers had five players finish with 20 or more home runs. The team also featured four future Hall of Famers: Yount, Molitor, Sutton, and Fingers. In the ALCS, the Brewers faced the California Angels for the right to advance to the World Series. Kuenn’s former manager, Gene Mauch, managed California. The Brewers got a big base hit from Cooper in the bottom of the seventh in Game Five to take the series 3 games to 2 when the ALCS was a best-of-five playoff. Milwaukee became the first team ever to come back from a two-games-to-none deficit to win a five-game series. They advanced to the World Series but lost to the Cardinals in seven games. According to Kuenn’s wife Audrey, the Brewers were like a family while Kuenn was managing. In spring training the players would often eat at the Kuenn house in Arizona. During the summer they would go to the bar that the Kuenns owned. Kuenn returned to manage the team in 1983. This time, however, he would have to do it without two big arms. Starting pitcher Pete Vuckovich was out with an injury until late August. Rollie Fingers missed the entire season due to injury. The two of them had combined to win the last two AL Cy Young Awards, Fingers in 1981 and Vuckovich in 1982 thanks to an 18-win campaign. In addition to this, at midseason, Dalton traded local hero Gorman Thomas to the Indians for veteran centerfielder Rick Manning and pitcher Rick Waits. This ripped a big power producer out of the middle of the Brewers lineup. Despite that, the team managed to keep the division lead in their sights nearly all year. However, a 10-game losing streak in mid-September sealed their fate. The streak, brought on by a horrendous hitting slump, was part of a stretch that saw them lose 18 of 24 games. The Brewers limped home with an 87-75 record to finish 11 games behind the eventual world champion Orioles. On October 3, the day after Harvey Kuenn finished his only full season as a major league manager, Dalton fired him. The Brewers notified Kuenn of the move on October 1, the day before the team’s final game. Bud Selig offered Kuenn a job as a scout and minor-league hitting instructor with the Brewers. Kuenn was replaced by Rene Lachemann. In 1984, under Lachemann, the Brewers went 67-94 to finish last in the AL’s Eastern Division. Following the season Dalton fired Lachemann. Kuenn spent the remainder of his life in his new role as scout and minor-league hitting instructor for the Brewers. He and his wife continued to winter in Arizona. During the summer months, Harvey would travel from Wisconsin, mostly to Chicago, as an advance scout for the Brewers. On February 28, 1988, Harvey and Audrey were preparing to play golf when Harvey went to use the restroom. When he did not come out for a while, Audrey went to check on him and found him dead. He died of a heart problem that resulted from the poor circulation that had caused him so much trouble over the last twelve years of his life. He was two months past his 57th birthday. Bob Uecker read the eulogy at Kuenn’s funeral. Six players from the 1982 Brewers served as his pallbearers. The University of Wisconsin inducted Kuenn into their Sports Hall of Fame in 1991. He also had his name placed on the Brewer Walk of Fame at Miller Park in 2005. Kuenn was eligible to have his name placed on the Hall of Fame ballot in 1972. However, when the Brewers activated him in 1971, his appearance on the ballot was delayed by five years. In the 15 years that his name appeared on the ballot, Kuenn never received the necessary 75 percent of the vote needed for enshrinement. Okrent, Daniel. Nine Innings. New York: Houghton Mifflin Company. 1985. Pluto, Terry. The Curse of Rocky Colavito: A Loving Look at a Thirty-Year Slump. New York: Simon & Schuster. 1994. Dolson, Frank. “The Homer that Made Kuenn Blush.” Baseball Digest, January 1963. “Garner Wins Three-I VP Prize” The Sporting News, September 10, 1952. 44. “Mark Big Week in Kid Roundup” The Sporting News, June 18, 1952. 36. The Sporting News, January 30, 1957, page 11; February 27, 1957, page 20; March 6, 1957, page 16; May 1, 1957; April 30, 1958; January 7, 1959; May 20, 1959; April 10, 1971; September 18, 1971, page 30; and January 1, 1972. Interview with Audrey Kuenn, January 24, 2010. Interview with Harvey Kuenn III, December 31, 2009. Milwaukee Sentinel, June 15, 1952. Racine (Wisconsin) Journal Times, December 9, 1948. Rhinelander (Wisconsin) Daily News, October 27, 1948. Wisconsin State Journal (Madison), August 2, 1949; May 15, 1952; and December 10, 1952.